Governor Brig. (Dr.) B.D. Mishra (Retd.) chaired a high-level meeting to finalise the proposal for new Kendriya Vidhyalayas in the State. The Governor of Arunachal Pradesh Brig. (Dr.) B.D. Mishra (Retd.) chaired a high-level meeting on Monday at Raj Bhavan, to finalise the proposal for new Kendriya Vidhyalayas (KVs) in the State. In depth deliberation to meet inertia for opening of KVs in seven identified KVs at Kurung Kumey, Dibang Valley, Namsai, Upper Subansiri, Anjaw, West Siang and Upper Siang Districts were finalized in the meeting in presence of Deputy Chief Minister Chowna Mein, Commissioner Kendriya Vidhyala Sangathan, Santosh K Mall, IAS, Secretary Education Dr. Madhu Rani Teotia, and Joint secretary Education Rahul Singh. Stating that education is the paramount requirement of any society for the development of the people, the Governor emphasised the necessity of having good central schools in different parts of the State particularly in those districts where there is no schools such as JNVs, KVs and RK Mission schools. 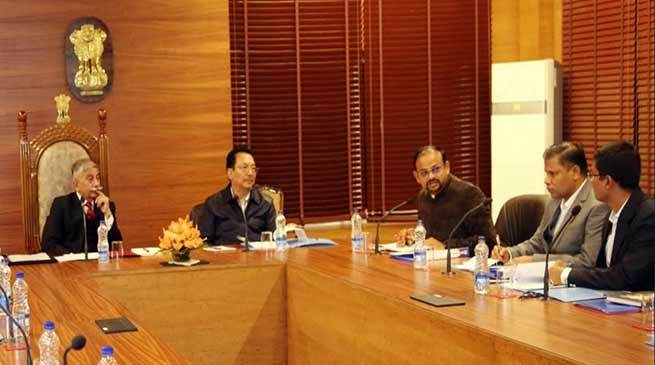 The Governor called for concerted effort from the State Government and Kendriya Vidhyala Sangathan to strengthen education in Arunachal Pradesh. He also advised the State Government to facilitate in providing land and other requirement for establishment of the educational institutes. The Governor asked the Deputy Commissioner, Kendriya Vidhyalaya, Tinsukia to extend his stay by two days in Itanagar and directed the Secretary Education Smt Tiotia to finalize the proposals, after obtaining them from the concerned Deputy Commissioners and submit it in approved official format, on behalf of the education department, Govt. of Arunachal Pradesh, to Deputy Commissioner, KV, Tinsukia by hand before the latter departs from Itanagar. The Governor asked the Commissioner Kendriya Vidhyala Sangathan for speedy action for the Frontier State of Arunachal Pradesh. The Commissioner KVS is visiting the State at the invitation of the Governor. Deputy Commissioner of Namsai Smt Tapasya Raghav and Deputy Commissioner of Kurung Kumey Binod Kumar Behera and representative of DC Upper Subansiri, Smt Dani Riliang and officials from Kendriya Vidhyalaya Sangathan attended the meeting.